Whaaaa? You say. How can perfection be unrelated to success? Isn’t that what we should be striving for? This has become a mantra in our house. Whenever one of us is hemming and hawing about getting started on something or self-flagellating about doing poorly on a test or not getting everything on our to do list done, the others are quick to pull out this line that my husband coined a while back. “Perfection is unrelated to success.” This does not mean that we shouldn’t all strive for quality and excellence in our endeavors. It just means that if you’re in the arena, getting messy and running into roadblocks, and watching YouTube videos to figure s*** out, you’re much better off than if you were to stand on the sidelines trying to wrangle ever-illusive perfection. 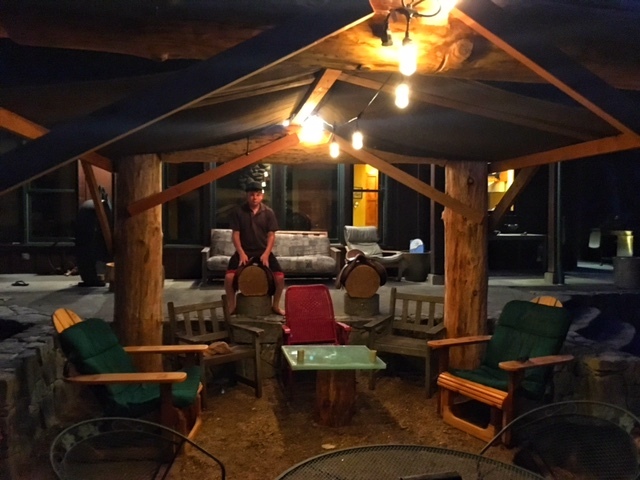 This summer, Mike started building an outdoor living area. From scratch. Out of logs. Logs that he cut down, peeled and cured himself. This structure that we now lovingly call The Lodge, was an exercise in the absence of perfection but in the absolute celebration of the messy process. There are notches that are six inches from where they should be. It’s currently stable due to a pick up stick arrangement of two by fours tacked to the sides. Oilskin tarps make up the roof. We spend one infuriating morning trying to perch a one-ton log on top of two support posts. The tractor almost ended up in the pond, I almost ended up under a log and after hours of repeated trial and error, we never did get the dang thing up there. (Until days later.) It may be years before it’s complete. This incomplete thing MADE our summer. Sagging tarps and rogue two by fours went unnoticed as we basked in shadowy light and sweet shade. We had parties in there. We spent every evening in our lit sanctuary- reading, playing games or just siting. It was perfection. Sometimes, it’s when you give up the chase that the thing you’re in pursuit of comes and sits at your door. Waiting for you to notice it. Almost anything meaningful you take on will be creative- a resume, a project, a diet, a book, an act of courage of any kind, a new venture or business, a marathon or a mountain. That means it will be vulnerable to the creative process. And that means perfection will get you nowhere. Passion and persistence will pay off in spades. Whatever it is you’ve been wanting to do, I challenge you to get messy with it. Go for no’s. Get your hands dirty. YouTube away. Invite mediocrity if that gets you started. And enjoy the highs and lows of being in the arena rather than sitting in the bleachers.